The Key to Autism is an invaluable and comprehensive resource for any professional assessing and treating autism in children and adolescents. 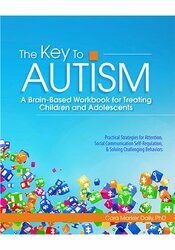 Filled with dozens of case examples, exercises to understand how the brain with autism works, the latest tools for screening and assessment, and “how-to” sections for applied behavior analysis (ABA), this workbook is the key to understanding the minds of children and adolescents with autism. Over 25 downloadable worksheets and activities you can use immediately! Cara Marker Daily, PhD, is a licensed clinical psychologist with over 20 years of experience providing assessment and treatment for children, adolescents and young adults with autism in the home, school, hospital, and community settings. Dr. Daily is the president and training director of Daily Behavioral Health, a leading behavioral health provider in northeast Ohio specializing in assessment, consultation, and treatment of autism, anxiety and disruptive behavior disorders. She is also the founder and executive director of the Building Behaviors Autism Center, a nonprofit organization that provides free and reduced cost applied behavioral analysis services to families of children with autism spectrum disorders. "Dr. Daily's book is written with remarkable clarity, and will be a wonderful, frequently used resource for professionals, parents, and learners wth autism. She provides a unique blend of conceptual and practical information, with an up-to-date account of the DSM-5 and all details related to coding. Her perspective of the way people with autism process information is a testament to her extensive professional experience and her understanding of living, thinking and breathing with autism. Dr. Daily's case studies, valuable teaching tips, and elaborate resources are a true gift to this field."